- The in-silico design of novel compounds for targets of interest to clients. - Synthesis of potential new inhibitors. - Structure-activity studies. Assistance with Hit to lead to pre-clinical candidate development. - In vitro cell viability /cell growth studies, against a broad panel of human derived cancer cell lines. - In vitro toxicity studies (CYP, hERG, PMBC) Oral, IV and IP formulation studies. - Acute in vivo toxicity studies (Irwin test). (01/04/2018) ICIC is greatful to The Swallows los Cristianos for making a donation One more year The Cancer Reseach Institute of the Canary Islands is very grateful to The Swallows, Los Cristianos, Tenerife for their donation of 4.000€ to help us with our cancer research activities at the Foundation ICIC. The website MACBIOBLUE.com, blue biotechnology project and study of algae in Macaronesia, is now available on the internet. Project in which the Canary Institute for Cancer Research has collaborated and participated extensively, together with other entities, institutions and companies. CEAMED SA, a company promoted and developed in the FICIC, has created a division of services. Among other activities, it makes quality controls of Aloe Vera for producers in 26 countries. Providing these producers with a quality certificate for their Aloe Vera. (05/04/2017) ICIC receives a donation from The Swallows Los Cristianos The Cancer Reseach Institute of the Canary Islands wants to thank one more time The Swallows, Los Cristianos, Tenerife for their donation of € 6,000. Their support is very much appreciated. 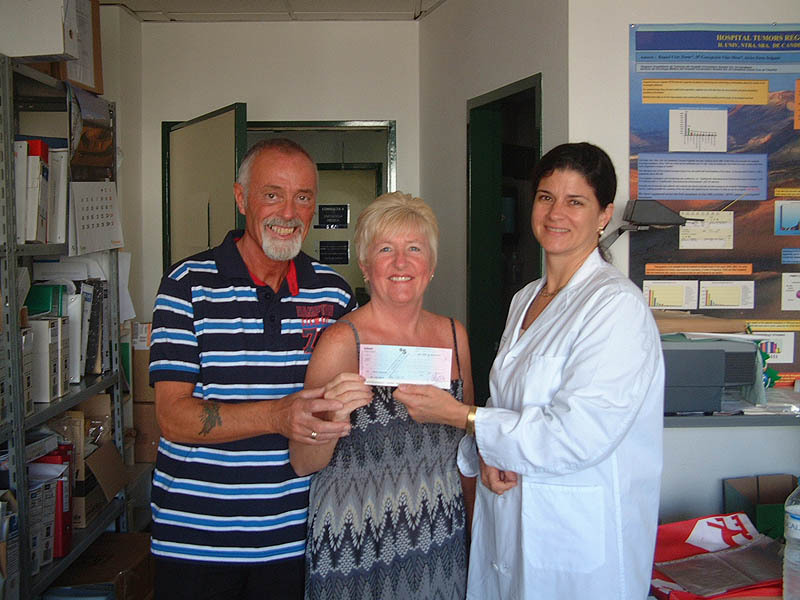 (28/07/2016) The Swallows los Cristianos donates to ICIC The Cancer Reseach Institute of the Canary Islands is very grateful to The Swallows, Los Cristianos, Tenerife for their donation of € 6,000 for the development of activities of the Foundation ICIC. Thank you so much for your support. (25/04/2015) ICIC is greatful to The Swallows los Cristianos for making a donation The Cancer Reseach Institute of the Canary Islands appreciates and is very grateful to The Swallows, Los Cristianos, Tenerife for their donation of € 12,500 for the development of activities of the Foundation ICIC. Thank you so much for your support. (13/06/2013) ICIC is greatful to The Swallows los Cristianos for making a donation One more year The Cancer Reseach Institute of the Canary Islands appreciates and is very grateful to The Swallows, Los Cristianos, Tenerife for their donation of € 8,000 for the development of activities of the Foundation ICIC. (20/06/2012) The Swallows los Cristianos makes a generous donation to ICIC The Swallows los Cristianos makes a generous donation to the Cancer Reseach Institute of the Canary Islands. ICIC is very grateful to The Swallows, Los Cristianos, Tenerife for their donation of € 5,000 for the development of activities of the Foundation ICIC. (15/09/2011) Collaboration agreement 2011 Caja de Canarias ICIC Thanks to the collaboration that maintains Obra Social of La Caja Insular de Ahorros de Canarias with the Canary Islands Cancer Research Institute (ICIC), a collaboration agreement by which this financial institution supports the development of scientific and educational activities of ICIC with an amount of 8,000€ was signed yesterday in Las Palmas de Gran Canaria. We greatly appreciate the support that this organization has provided us through its Obra Social, especially in these years of hardship. (01/08/2011) 1st Atlantic Biotechnology Conference. Natural Products and Drugs Registration open. Limited seats.